This minimally-invasive outpatient procedure is designed to remove the damaged portion of the meniscus, a layer of cartilage on top of the tibia that cushions and stabilizes the knee joint. The procedure may be performed with local or regional anesthetic. The meniscus is a C-shaped cushion of cartilage in the knee joint. When people talk about torn cartilage in the knee, they are usually referring to torn meniscus. If a meniscus is so badly damaged it cannot be repaired, it may need to be removed or trimmed out. Without the meniscus cushion, persistent knee pain and arthritis can develop. For many older patients with this condition, a knee joint replacement might be the right option. But active people younger than 55 may be eligible for an alternative treatment: meniscal transplant surgery. A meniscal transplant replaces the damaged meniscus with donor cartilage. Meniscal transplants are not right for everyone. If you already have arthritis in your knee, a meniscal transplant may not help you. 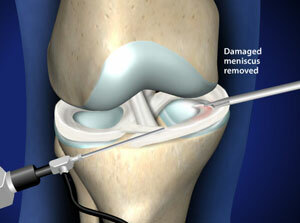 But for a select group of people, meniscal transplants can offer significant pain relief.